Actor, comedian, writer, and director Shane Adamczak has certainly had a diverse career. From Brad Majors (in Richard O’Brien’s Rocky Horror Show), to Johnny Rotten (Vicious Circles) to an 80s pop star in Stan’s recent Hungry Eyes ad campaign (and minor internet sensation) he has a certain star quality. Now Adamczak is exploring stars of a different type in his upcoming one man show. 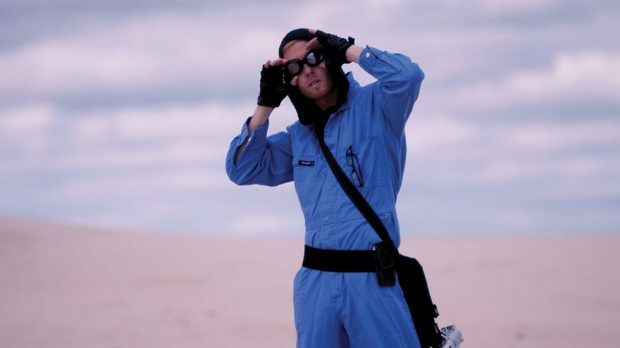 DAVID O’CONNELL spoke to Adamczak about his latest role, that of a stranded and alone astronaut in the upcoming STASIS, which blasts off at the Blue Room on October 10. How are those Hungry Eyes? The Hungry Eyes are good mate, yeah that was a real trip how well that commercial was received. A super positive response. People seem to be really enjoying it. I got a lovely message from Eric Carmen and his wife (the guy who wrote the song) about how much they enjoyed the commercial. OK, the dreaded obvious question, what is STASIS about? STASIS is about an astronaut who gets trapped on a spaceship for two years by himself. The idea was to create a show that imagines Ripley at the end of Alien, if she wasn’t able to go into stasis. Everyone is killed, she’s the last survivor, but she has to stay on the ship. It’s looking at the idea of finding solace in isolation, being able to live with yourself away from the rest of the world. So it is not just a psychologically distressed state creating a rich fantasy world, this is pure sci-fi? It’s my love letter to sci fi. It’s somewhere between Alien and Red Dwarf. It’s quite serious, quite scary at points… but also quite heartwarming and funny at points as well. So STASIS is exploring those popular social themes like how isolation effects individuals, like in Silent Running and Red Dwarf? How did it come about? I’ve always been a huge fan of sci-fi. It has been my go to genre, but I’ve never created a pure sci-fi show before. I was also in a long distance part of a long distance relationship. I was not only away from my partner at the time, but also living in Perth, which a we all know is the most isolated city in the world, and can feel like that at times, although at other it 100% doesn’t. I looking at that idea of being by myself, and merging all those ideas together. Your work has often been described as having a dark sense of humour. Why do you find yourself drawn to that sort of style? I think since growing up, comedy has always been a defense mechanism for me. Now, I’ve grown out of that emotionally, but it has found it’s way into my work. I like to deal with big issues like isolation and the effects of being alone, but the way to make that palatable to audiences is with humor. It’s an incredibly powerful tool, especially in theatre. To get people on board, then to get them laughing is a really emotive feeling, but to also get a darker underlying message as well. Of course sci-fi also has a tradition of playing to those wider social issues as well. Sci-fi is so fun, there’s so many tropes that everyone understands. Even if you are not a fan, you know how things are supposed to work. Lightsabers airlock doors, blasters, aliens. There’s all this fun stuff I got to use to tell the story. Obviously over the last couple of years there has been a few sci-fi works to make it’s way to the local stage. What do you think it is about the genre that is so popular at the moment? I don’t know to be honest, even at the Blue Room with their collection shows that has happened. Even when I was touring in Canada there’s sort of a collective consciousness. Like one year it was the zombie apocalypse, the next there’s a whole bunch of time travel, this year it is all about superheroes. As artists there’s something in the air that bring these things to the surface, that makes you create different works all based around the same themes and ideas. You’ve spoken previously about your love of the Blue Room as a venue, what do you find so compelling about the place? The Blue Room is such an amazing hub for independent artists. Brand new artists and even established artists that want to try out new works. Honesty there’s not many places we can go to do new works. It’s perfect form indie theatre. How are you finding putting on a solo show again? I used to do so many solo shows, and recently I’ve been working on more ensemble pieces. So this is my first foray after a few years away from doing solo shows, and this is my most ambitious solo show. This is a full on play. There’s a set, and there’s a lot of technical thing in terms of gadgets and lights. So it’s a big step forward for me in terms of solo work, but it’s a lot of fun, and I’ve got a really great team helping me work on the show as well. I noticed Tim Watts as a puppetry consultant, is that a spoiler? Not really. Tim’s a good friend of mine. He’s helping with the puppetry stuff. I’ve got a friend of mine from Adelaide, Calixta Cheers, who is an amazing cosplay artist (CaliGirl) and costume designer. So exactly the right person to design my space suit. It’s currently on the way across Australia, but I’ve seen video footage and it is the coolest. I’ve also got Michael Fragomeni from Brainstorm Studios, who’s working on a score for this and making it sound like an epic film. I’ve always been a fancy the two chairs and a guitar style of theatre. This is a lot more ambitious. We’ve got a platform that moves that creates a whole bunch of different things. There’s a lot of stuff in this show, a lot of stuff.